"Sympathy to the King family on the loss of a great lady"
Joan King ~ On Sunday, October, 28, 2018, the King family lost their Matriarch, the one who kept us together and instilled the importance of family. 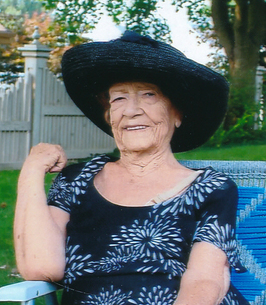 Mrs. Winnifred Joan (Brown) King of Listowel, passed away surrounded by her family at Listowel Memorial Hospital, in her 97th year. Beloved wife of the late Leonard King who called her his English Rose. Mother of Pat and Don McIntosh of Atwood, Leonard and Donna King of Listowel, the late Greg King, and the late Dana King. Joan was born in Blyth, England, in 1922, and came to Canada as a war-bride in 1947. She will be remembered for her strength, love of family, pride in her English ancestry, and her great fashion sense. Her death will leave a tremendous void in the lives of so many. Visitation will be held at the Eaton Funeral Home, Listowel on Thursday from 2:00 to 4:00 and 7:00 to 9:00 p.m. where the funeral service will be held on Friday, November 2nd at 11:00 a.m. Rev. Peter Baldwin officiating. Memorial donations to the Listowel Legion, or Terry Fox Foundation would be appreciated. To send flowers to the family of Joan King, please visit our Heartfelt Sympathies Store. Len, Donna and Family ...we were so sorry to hear that you had lost a very special member of your family. She was well loved and well cared for by you all and the rest of us can only hope to live a life as long and as full as hers. Deepest sympathy to the King family. Joan will be missed. So sorry to hear of your mom’s passing. The age never matters how the loss of your mom leaves you feeling. The one thing I found comfort in was knowing that mom was able to return to her one true love after almost 40 years. May God Bless you all. Joan was a loving and gracious person who epitomized the definition of "lady". She adored her husband and family and saw her share of grief throughout her life. Her Anglican faith was very important to her and helped to sustain her. Sincerest condolences to Len and Pat and all your families as you mourn her loss.